January 2012: After a pepper-sprayed teacher dies, MKA says it is “not deadly.” This ferocious pepper spraying assault on the day of the strike shows that the government is rattled by the Left, for the first time in a long time. The Left’s December strike called for Jamaat ban, which presumably pleases the AL government, and we noted the police generally left strikers alone. This time, the strike was to protest rising fuel prices, and the fault clearly on the government. Home Minister MK Alamgir’s instruction seems to have been to use maximum force. Water cannons, pepper spray, batons, everything came out. CPB has demanded the Home Minister resign, and the use of pepper spray is being debated. When the chatterati talks about Third Force, 2/11, etc they are thinking of a) players left out in the cold, b) once broken now again strong, c) old players returning to field. They are imagining/fearing/predicting new alignments with players such as Army, Shushil Shomaj, Embassy Row, etc. But one player that does not occupy a lot of mindspace is the Left. Why is this so? Is it as structural weakness of the Bangladeshi Left, that they never need to be taken seriously? Or is it the blind spot of the Bangladeshi chatter class, that they will entertain every possibility except of the Left becoming a crucial player, one day? Last summer, when various Left parties announced a grand coalition of Bam Boloy (Left Belt) the initial news is a tiny page 18’er. But the news two weeks later that there is a potential rupture in the Boloy is a gleeful front page item (even in Prothom Alo, which has ex-Communist Party activist Motiur Rahman at the helm). The message is clear, “bollam na, eder diye hobe na” (told you, they will never amount to anything). This winter, when various small Left parties attempted a revival and announced hartals, there was disbelief from the media. Left calls hartal? Only BNP, AL (and recently JI) are allowed to call hartal, it seems. MA Muhit, the king of shoot-from-hip bon mots, gets a dig in: Leftists are Theorists! “It’s usual that the leftist parties will observe hartal as they don’t know how the state is run. The Left parties are observing hartal…we aren’t surprised at it. They go by theories… But how the BNP observed hartal?” This is perhaps the first time an AL minister has given a semi-compliment to the BNP– “You know how things work (by the way you’ll be here too soon enough).” All in the aid of giving a elbow in the eye of the Left. “You see, we– BNP and AL– we know how things work. Five years you, five years me. The left, now they operate in fairytale land.” That is the gospel according to MA Muhit, about whom… well, let the record, his broken record, speak for itself. Worst Finance Minister in recent history, but it’s the Left that lives in cloud land. Speaking of that December strike. The specter of the Left trying to ban the Jamaat seems an ill-thought out strategy. Their strategy should be to defeat Jamaat electorally at the polls, not to appeal to the Awami League (of all people, the Left forgets AL’s historic banning/annihilation role against the Left in the 1970s) to ban the party. If they are banned, they will only reappear as a new party– hungrier, stronger. The Islamists seem divided over a response to leftist hartals so far, but that will also change. There are many more crucial issues than banning JI which should occupy the Left. I received an email from a colleague who is organizing Tazreen solidarity events: “Lot of debates going on about this. Even though the workers themselves proposed a strike in the garments sector, CPB, BASAD, nobody agreed. The main parties of the Bam Morcha did not support it. And yet, they are calling a hartal over Jamaat Shibir.” That is right, shouldn’t the garments sector crisis be a key focus of the Left? Or have some of the Leftist leaders become garments factory owners in the meantime? The news of BNP trying to endorse the Left Hartal over fuel prices shows that BNP-vs-AL will try to use Left as a foil. If we think back to 1970s Zia era, the reason the Left was rehabilitated and brought into government is only to kon-thasha the AL. Since the AL had spent 1972-1974 hunting down the Left (JSD, Sarbahara, etc), Zia understood that the Left would not join forces with any AL counter-coup against him. Thus Left leaders were brought into the government, or at least brought out of jail. Today, we see the same equation, the BNP again trying to coopt the Left’s new spurt of activity. All to make themselves the kingmakers and future kings (and queens). Will the Left (and I am using broad terms deliberately so as not to endorse one leftist tendency over another) allow itself to be played, again? Or will it find its own voice, platform, space, strength. The historical conditions are there for a revival of the Left. 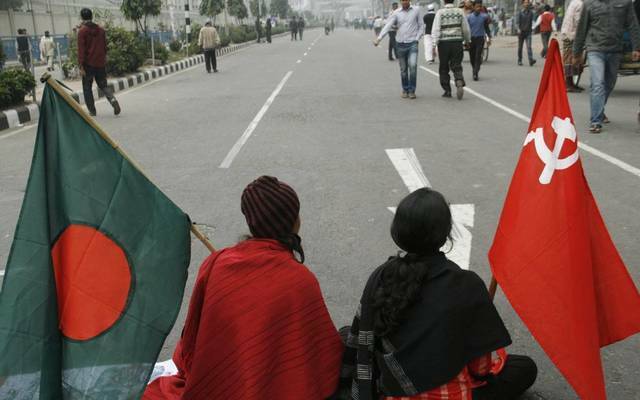 Every issue Bangladesh is facing– donor slavery, INGO recycling, neoliberal madness, go-go capital, bank crisis, the exhaustion of NGO sector, gangster patronage– these can and have been the vital issues of the Left. And in Latin America the Left (admittedly with far deeper historic roots than in Bangladesh) has leveraged popular anger over all this to come to power. Neither BNP, nor AL, nor JI has any historical strength when it comes to this issue (the key debate between BNP and AL is who will control the levers, not about the system). Yet they continue to prevail because the Left has been unable to become united on one platform. The left has many vital thinkers on their side. Yet they have been unable to leverage that strength. In spite of some unwise alliances, Farhad Mazhar is one of our most innnovative thinkers. In spite of predictive errors, Badruddin Umar is a truth teller, especially in comparison to the Lilliputs that populate BNP and AL’s “intellectual wing.” When he says: বাংলাদেশ এখন পরিণত হয়েছে গরিবের দোজখে (Bangladesh is now a hell for the poor), every word rings true. The Left lost a crucial leader when Nurul Islam was assassinated in 2008. The state’s utter disinterest in pursuing the case shows that to AL and BNP, the only good Leftist is a dead Leftist. Can the Left climb back out of their historic cul de sac. If we keep imagining Third Forces, why can’t the Left be one of those third forces? No matter how strongly the left parties claim their programme to be successful and trumpet their essential difference, political and ideological, with the incumbents, the hartal is highly likely to send wrong signals to the people in general and those sympathetic to left politics in particular. The camaraderie between the pickets and the police — and by implication, the government — is entirely likely to make the public believe that these left-leaning parties may have also become opportunistic and chosen to toe the incumbents’ line. Suffice it to say, such a perception would be very difficult to dispel. Most importantly, the Communist Party, the Socialist Party and the Democratic Left Alliance may have severely undermined the left camp itself and set back its progress in national politics. We would like to believe that it was a tactical blunder on the part of the left leadership, and not willful deviation. Hence, instead of pointlessly staking claims for a success that was never there in the first place, the left leaders need to engage in damage control. A candid admission of mistake would certainly be a good start to this end. Its hardly a hartal when its their mates in government and the government isnt using the police against them! Badruddin Umar, good historian, Loved his father Abul Hashim’s book “The Revolutionary Character of the Kalima’, Lefty Islamism that never was. Maulana Bhashani used to hope that lefty folks would eventually unestrange themselves from religion. The time for rethinking to be social decorate! This is true it may now possible to establish equity with struggle and conflict, but need and possible to establish human rights and democracy beyond the capitalism. the only ideological forces left in Bangladesh politics are the fundies and leftists. AL and BNP are ideologically bankrupt, but politically expedient. it is time for an ideological renaissance in Bangladesh, with democratic, secular and socialist ideologies converging. I do not consider myself of the left. And I don’t believe all these are necessarily big problems in Bangladesh. But these are definitely problems that the Left can, and should, tackle.